Warren at York is an 11-story rental property in Jersey City. MW Interiors provided full interior design services, concept design through construction documentation, for all common areas and units. Furniture and accessories services were provided for the main lobby, amenity room, and outdoor lounge. The design concept is Urban Rustic Chic. 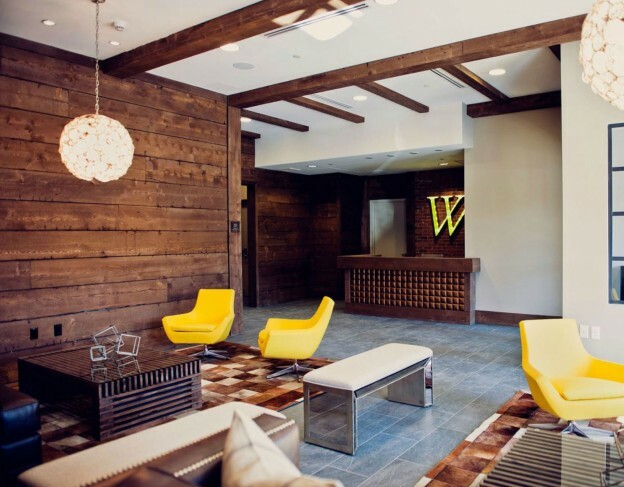 Reclaimed brick and wood planks from the previous buildings on site are used as feature elements in the main lobby, amenity room and corridor elevator lobbies. Rustic furnishings combined with chic accessories complete the aesthetic. Yellow was used throughout the furniture and accessories to tie the design back to the building’s marketing scheme. The 3rd story outdoor terrace design creates a secret garden for tenants. MW Interiors also developed the typical unit interior finishes including mosaic glass tile at the kitchen backsplash and engineered wood flooring. This entry was posted in Interior Design on October 27, 2014 by Melissa Thomson.